this is a picture of the world's most expensive hamburger. it is sold at Serendipity 3 and goes for $295. that is the burger alone, no sides. 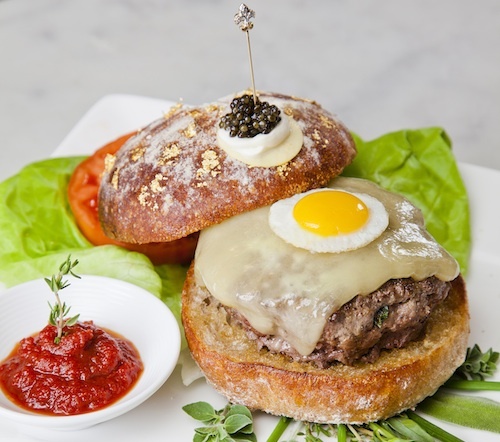 the sandwich contains Japanese Waygu beef, 10-herb white truffle butter, smoked Pacific sea salt, 18 month cheddar, shaved black truffles, a quail egg, and a white truffle-buttered roll. oh and it comes with a solid gold, diamond-encrusted toothpick. and yes people order this and eat it. i only point this out because people are on the Twitter complaining about $200 is too much to spend on a date. *raises eyebrow* for the complainers, i have a few questions. What do you consider a date? If employed, what do you do? those questions seem superficial, but they are very relevant. if you are 18 and in college, $200 is too much for a date. take her to the dining hall and use your meal plan to feed her. if you don't use it, you lose it. (at least at JMU it was that way) if you are not working, $200 is too much for a date. why are you trying to date anyway? i say focus on getting back on your feet before you try and treat some girl to get a quick hit. (i did hear people have fallen in love over turkey burgers though #noAmberRose) if you have a job and don't earn $200 in a day, $200 is too much to spend on a date. i will assume you have to use that hard earned money to pay bills, so wasting it on a date is not such a good idea. if you have a mortgage payment or live with your momma, $200 is too much to spend on a date. that money needs to go toward your living situation, whether it is to find a new one or maintain the one that you are in. if your last date was in the 90's, then $200 is too much for a date. inflation has not been good for the economy and you may need that $200 for spousal support. i say all that to say, any excuse can be given to NOT spend $200 on a date. but if a man wants to spend that much money on a date, sit there and enjoy it because it will not happen all that often. the cost of the date is the least important thing. is the person you are spending time with someone you enjoy? because if not, it was a waste of time and money. I could spend $200 getting ready for a date, seriously. Hair nails, feet, make-up, outfit--he better be willing to spend $200 for a date!! !